This article was published on Dr. Berhanemeskel Segni’s facebook page on 04 October 2017. Four Major Heroes and the Heroines of Grand Irreecha 2017 Thanksgiving Holiday! 1. The Esteemed and the Most Honorable Abbaa Gadaa Beyene Senbato! The unmistakable and undisputed hero of Irreecha 2017 Thanksgiving Celebration is the visionary, brave and wise leader of all the Oromo people and the leader of the Oromia Abbaa Gadaa Council. He is the Esteemed and the Honorable Abbaa Gadaa Beyene Senbato! He is the architect of all the success and victory of Irreecha 2017 Thanksgiving Celebration. He is the engine behind the making Irreecha an independent, nonpartisan and national treasure of the Oromo people in honor and as a tribute to the Martyrs of 2016 Irreecha Massacre. He is the man behind the reestablishment of Foollee Gadaa Community Police! He is the establisher of all the Chaaffee Council and the bridge builder among all Gadaa leaders from all the ten Gadaa Regions Oromia. Abbaa Gadaa Beyene Senbato is the hero and national leader of all of the Oromo people. He deserves our praise and our honor! 2. H.E President Lemma Megersa of Oromia National Regional Government! His Excellency President Lemma Megersa of Oromia National Regional Government is another undisputed and unmistakable hero of the Grand Irreecha 2017 Thanksgiving Celebration! The leadership provided by President Lemma Megersa helped the reestablishment of the yearly Irreecha Thanksgiving Holiday as an independent, nonpartisan, non-political and universal Oromo national holiday for the first time since the TPLF/EPRDF come to power in 1991. It is very important to reflect back on the history of the Irreecha celebration over the last twenty six years to understand and appreciate the significance of President Lemma Megersa?s role and decision. In the initially years of TPLF/EPRDF rule, Irreecha was not only discouraged but Oromo leaders and participants of Irreecha Thanksgiving Celebration were being arrested, tortured and openly discriminated against. When through the sacrifice of many brave Oromo leaders and the Oromo people the Irreecha Thanksgiving Celebration caught fire and spread among the Oromo people like wildfire, the TPLF/EPRDF through its local stooges in the OPDO changed tactics and politicized it where its cadres and armies of lairs and deceivers parrot to the people. That process continued until last year?s Irreecha Massacre. Here is where President Lemma Megersa?s importance and heroic stand comes in. He broke with all the traditions and practices of the TPLF/EPRDF. He rejected all the known positions of the TPLF/EPRDF stands of intimidating, suppressing, ignoring or politicizing Irreecha Thanksgiving Holiday. He recognized the importance and place of the Irreecha Thanksgiving Holiday in the Oromo Society and among the Oromo people. He stood for its independence, nonpartisan and nonpolitical nature by refusing to speak at the event even when his own supporters and admirers urged him to speak. He prohibited all regional and federal officials and other cadres of the regime from speaking and appearing before the over five million people in attendance. He abided by the decision of the Abbaa Gadaa Council not to send any armed security and police forces, be it federal or regional, at this hallowed venue of the Irreecha Thanksgiving Celebration. He allowed the Foollee Gadaa Community Police to keep the peace and the orderly procession of the Irreecha Thanksgiving Celebration in cooperation with an unarmed Oromia police. He ordered the Oromia Broadcasting Network (OBN) to live broadcast all the Irreecha Thanksgiving Events starting from the eve to the whole day during the celebration. Many of us may disagree with him and his team on some of the political and policy stands he took since he assumed the Oromia presidency on some burning issues, but President Lemma Megersa is the undisputed hero and history maker of 2017 Irreecha Thanksgiving Celebration. We should all Congratulate and honor President Lemma and his team on their landmark victories and achievements. 3. Oromia Qeeroos, Oromia Activists and online Social Media Community Campaigners, Artists and Policy Advocates! 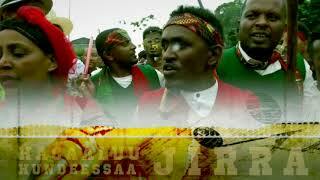 The other unmistakable and undisputed heroes and heroines of Irreecha 2017 Thanksgiving Celebration are that the Oromo people?s own sons and daughters (the Qeeroos, artists, activists, social media campaigners and policy advocates), who without any formal organization to name, mobilized, organized and led the Oromo people to match forward to restore human dignity, equity, fairness and justice to Oromia and Ethiopia. Without these fearless and mighty army of the Oromo people leading the people and making the impossible possible, none of the above victories and victors would have been made possible. Without Oromia Qeeroos, Oromia Artists, Oromia Social Media Campaigners and all of our brave people who turned the social media as a venue for social organizing, social mobilizing and sources of current news and views, none of the victories secured over the last three years would have been possible. These mighty army of the Oromo people played more than their share in the peaceful and orderly completion of the Irreecha 2017 Thanksgiving Celebration. Therefore, these mighty army of activists and youth leaders deserves our congratulations and honor as the heroes and heroines of 2017 Irreecha Thanksgiving Festival. The other unlikely hero of the Irreecha 2017 Thanksgiving Celebration is His Excellency Ambassador Michael Rynor of the United States to Ethiopia. It might look premature to praise Ambassador Michael Raynor, who just arrived in Ethiopia as the new appointee of President Trump, as a hero. Some even might consider my early praise of Ambassador Raynor as the Norwegian Nobel Peace Prize Committee?s award to President Obama barely after his election with some buyer?s remorse few years later. Make no mistake, I bet my early praise for the role H.E. Ambassador Raynor played in peaceful completion of Irreecha 2017 Thanksgiving Celebration is not premature. The leadership he provided to the United States Embassy Staffs to extend best wishes to the Oromo people days after his arrival says something very important about him and his stand and understanding of the changing political landscape in Ethiopia and the role of the Oromo people. His engagement with the Ethiopian government for the peaceful and successful celebration is unmistakable. His decision to congratulate the Oromo people in Afaan Oromo on Embassy pages when the TPLF/EPRDF led government of Ethiopia was adamantly voicing violence against the Oromo and openly despising and ignoring the national holiday of the Oromo people says volumes about the diplomatic skills of Ambassador Raynor. Don?t be surprised when you see Ambassor Raynor paying visit to the Office of the Honorable Abbaa Gadaa Beyene Senbato in Bushoftu, Oromia. Don?t be surprised when you see Ambassador Raynor providing his Ambassadorial fund and other United States aid and assistance for democracy, good governance and leadership development to the Foolllee Gadaa Community Police or the Oromo Abbaa Gadaa Council or help the reestablishment of the five standing political parties of Gadaa Democracy! For eagle eyed Diplomats like Ambassador Raynor it will not take weeks let alone months to understand that the road to democratizing Ethiopia passes through restoring the Gadaa Democracy in Oromia first! Call me wishful thinker, but my other hero of Irreecha 2017 Thanksgiving Festival is H.E. Ambassador Michael Raynor!